The lake as seen from the trail, with a spur of Mount Healy in the background. I had the day to myself. That morning I’d finished a brief backpacking trip on the Savage River, right in the middle of Denali National Park, Alaska. My knees were hurting a bit from older injuries. But I hopped on the park bus and rode all the way to the park entrance on the Nenana River. For most people, the park entrance is the just the gateway to see one of the greatest parks in the world. There are crowds of people and buses and cars. It hardly seems like a decent place for a hike at all. On my past trips to Denali, the park entrance has simply acted as a way deeper into the park. To the Savage River! To the Teklanika! 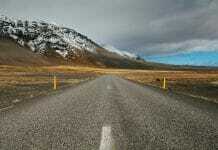 To Eilson or the Toklat, anywhere but the crowded park entrance. After all, didn’t I come here for wilderness backpacking, away from the hotels and the tourists? It’s hard to believe how long it took me to discover that I was wrong about the Denali National park entrance. Less than a mile west of the main bus stop there’s a place where the train line that runs from Seward to Fairbanks crosses the road. It looks like nothing, so easy to miss. 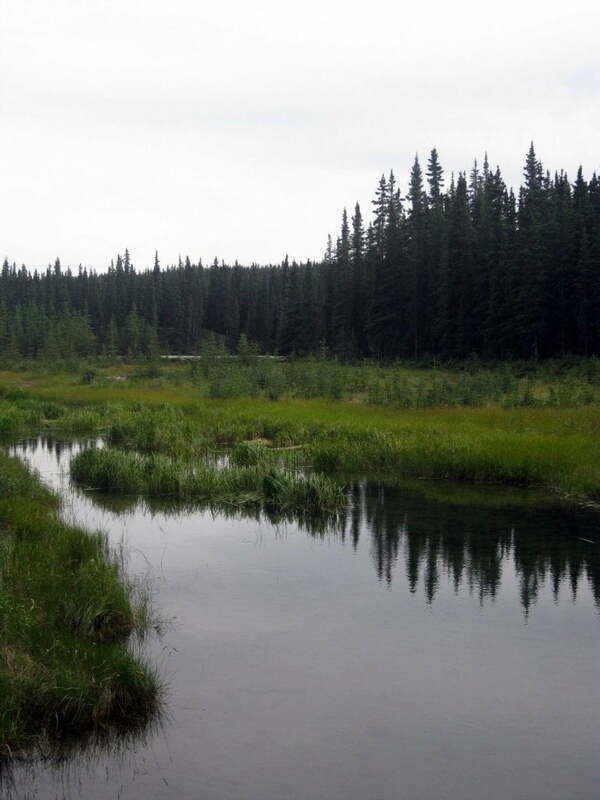 But a little bit to the north, up the railroad track, a trail leads through the boreal forest, between the dark spruce trees and the tundra. Rain was falling lightly, enough to ensure that I had the entire trail to myself. About half a mile in, the trail seemed to fall away at a bluff. I stood there in silence, looking out over a medium-sized lake framed by mountains, tiny cabins in the distance. I don’t know how long I stood there, eyes closed, just breathing. Horseshoe Lake and the Nenana River from the bluff, one of my favorite views. From there I descended the trail to Horseshoe Lake, down a series of wooden steps to the water. The trail split at that point, one to the left another to the right. Of course, they come back together as they circle the entire lake. 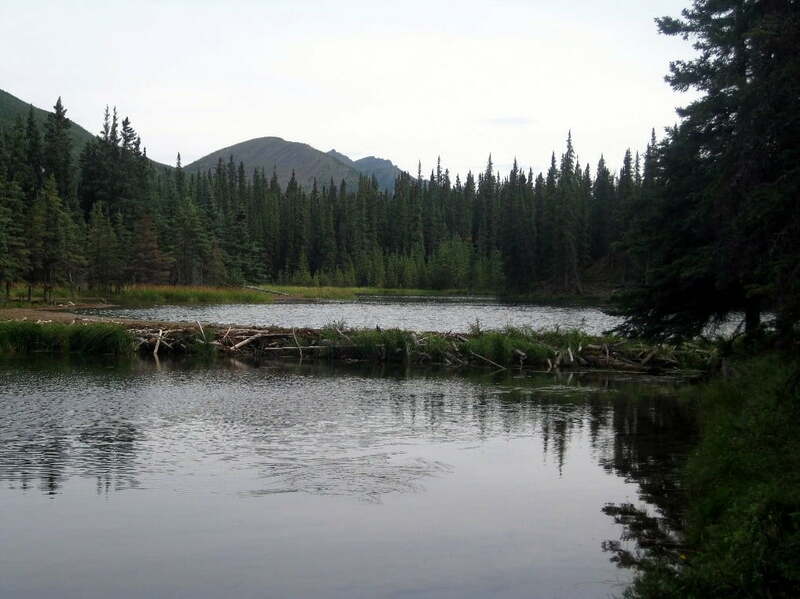 Horseshoe Lake isn’t one lake at all; it’s a series of lakes all formed by beaver dams. If I remember right, there are around four or five distinct lodges on the lake. Some lie tucked away in a corner, while others stand as impressive feats of engineering. They’re all done by remarkably intelligent animals smaller than my dog. The entire distance around the lake is only about a mile, a little more if you go down the side loops. I walked the trail slowly, trying to make as little noise as I could, stopping to take pictures whenever the rain let up. 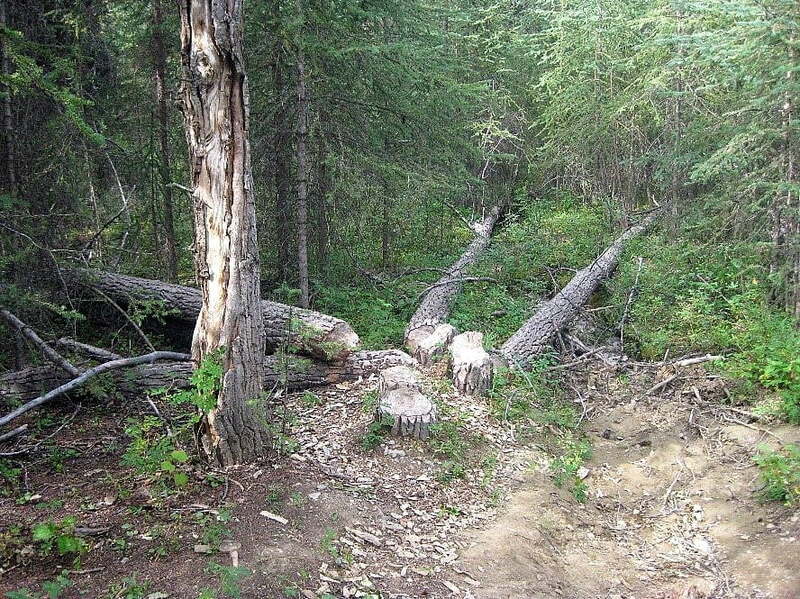 The forest was dense, but many trees were fallen on their sides. Maybe even one of five was cut down. Each of these trees had a neat, conical cut at its base, the unmissable mark of a beaver. Beaver felled trees by the lake trail. 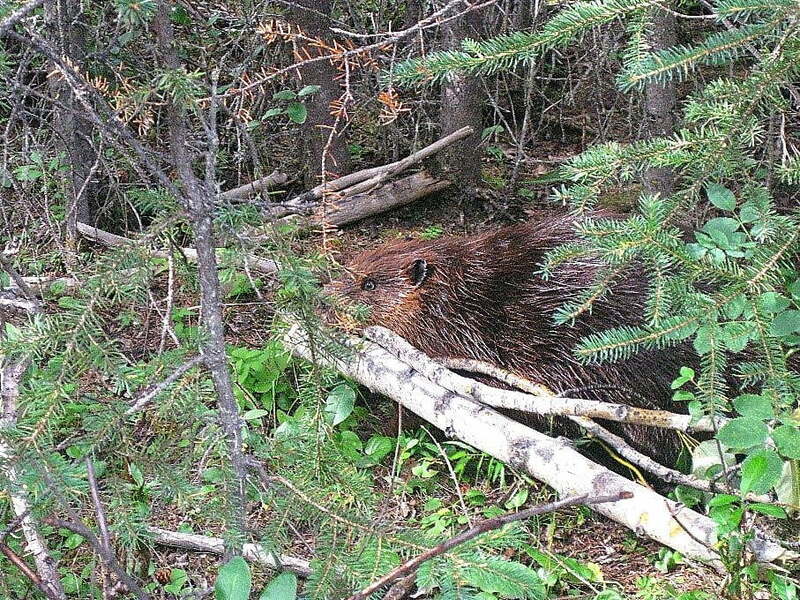 Only humans can match beavers for their ability to modify an ecosystem to their preferences. Then–a noise in the woods to my right. I peered through the trees, but couldn’t see anything through the dense forest. Until I spotted movement. A little brown animal, no bigger than twenty pounds, made its way through the underbrush. He was dragging a limb which he had chewed off of one of the many felled trees nearby. One more structural support for his lodge. If you’ve never seen a beaver in person, no camera can ever capture how beautiful their coats are. They’re certainly not cuddly (they’ve been known to take bites out of people’s legs when those people get a bit too close to their lodge). But they have a beauty to them, as an animal so perfectly evolved, so adaptable. He stopped for a moment to look up at me as if to ask me what I was doing on his turf. It’s easy to forget that beavers are rodents, not exactly the animals people see as smart. But this small rodent was holding a branch in his mouth, ready to add it to his house. This rodent has done more engineering and building than I have ever dreamed of. After a moment of contemplation, he seemed to decide that my camera and I were non-threatening. Then he continued on and slipped into the water with his branch. One of my favorite animals doing one of its favorite things. I continued around the lake, undeterred by the increasing rain. If anything I enjoyed the rain, as it guaranteed my solitude. The way around the lake was flat, a clear, open trail that took me almost no effort, just leaving me to my thoughts. I often go out for more challenging hikes. I enjoy steep ascents and long backpacking trips through the wilderness, away from anything but faint game trails. By all counts, this little trail around Horseshoe Lake should not be my style of hike at all. There I was, totally content, happy to be walking along the trail, not even particularly far from the nearest road. All this asks the question, why? What made me enjoy this hike so much when it doesn’t seem to be my style? I thought about that question for a while, but finally realized that the answer was both stupidly simple and right in front of me the entire time. So much of what I do is remarkably loud. This is true both as I go through my daily life as a student and also when I’m out backpacking in the wilderness. Even when I’m alone in my room, there is the constant background noise of the fan, not to mention the ever-present pile of work that has to be done. And when I’m out in the wilderness, I’m often thinking how best to navigate an area, searching for the best place to cross a river. Or simply cursing at the top of my lungs as I bushwhack through alders. What all of this is missing is not simply a physical lack of noise, but rather a deeper kind of quiet. For almost all of my waking moments, my mind is racing. As I made my way around Horseshoe Lake, however, my mind was quiet. I watched the beaver go about his day, stared at the rain falling on the water, and felt relaxed. It was a kind of peace that I’m not particularly used to, a type of feeling that put me at ease. One of about five different layers of beaver lodges on the lake. It’s hard to see in the picture, but quite a bit of this dam is made of freshly cut wood as the beaver family who lives there endlessly expands their home. 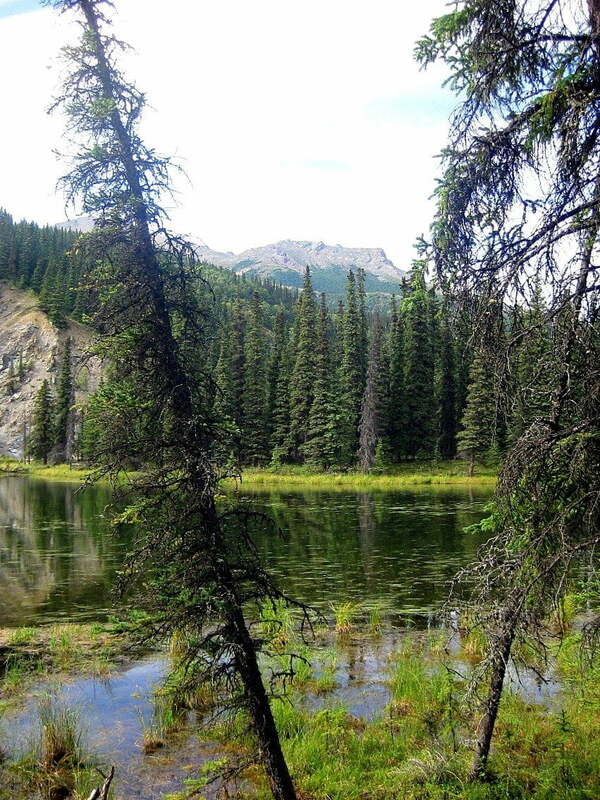 Horseshoe Lake in Denali National Park is one of my all-time favorite hikes. It’s not very hard to do, and it’s not particularly remote. But, especially in the rain, it is one of the quietest and most serene places I have ever seen. I have since returned to the lake two more times, and I can say it only gets better each time I go. When I was younger, I often thought to myself that a hike isn’t worth it if I’m not pushing myself in some way, or if there’s not some spectacular payoff at the end. I’ve long since let go of that idea because I think I’ve found something more real. I have found that the true value of a good hike is in the quiet and rest it gives me, not in struggle and sweat. Though I certainly still go on tougher hikes (Cross Mountain in Sitka, Alaska was a real monster), I do so in search of a little spot of peace for myself. What keeps drawing me back into the wilderness is not a sense of struggle, but rather a sense of contentment with what is around me. I go out into the field to find a secluded, quiet place, and stay there as long as I can. Where the lake becomes a marsh, with a glimpse of the Nenana River in the background. 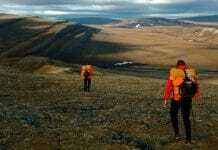 Looking to hike Denali? Check out the Park Service link below to learn everything you need to know before hitting the park. 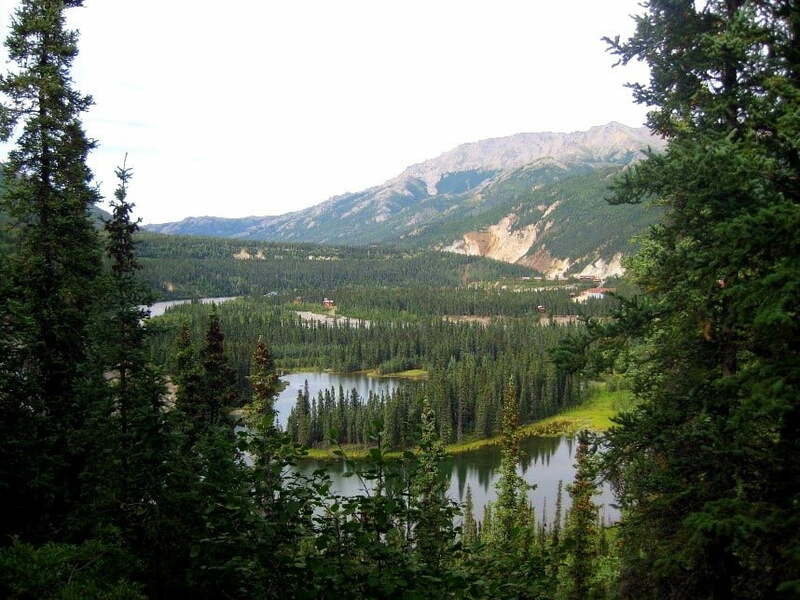 We love to hear reader stories – share your own Horseshoe Lake Hike or trips through Denali National Park – leave a comment below! What a cool story and hike! I can’t wait to get up to Denali again! Thanks! It’s a beautiful part of a beautiful state.